Montague Island, out of Narooma, is the South Coast's best kept secret, and Island Charters Narooma has been operating in the beautiful Batemans Marine Park for 25 years. Maximum of 11 passengers for a more personal touch. Chris and Cecilia took over in 2012 and love meeting people. They ensure they make your trip one of your best lifetime memories - whether fishing, guided PADI scuba diving, guided snorkelling, whale watching, Montague Island lighthouse tour, or their Meal with a Seal. They are a PADI dive vessel with Chris being a Divemaster. 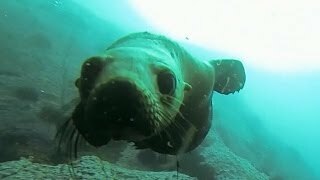 Come and swim with the puppies of the Sea, Fur Seal Swim.